Probably only one Union officer can match the cult of personality that has grown up around Confederate generals Robert E. Lee, Stonewall Jackson, and Jeb Stuart: George Armstrong Custer. 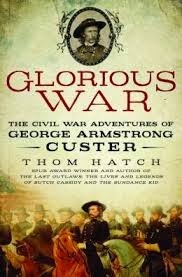 Thom Hatch undoubtedly agrees that Custer deserves the accolades appearing in the opening paragraph on the dust jacket of Glorious War. "This thrilling and definitive biography of George Armstrong Custer's Civil War years is nothing short of a heart-pounding cavalry charge through the battlefield heroics that thrust the gallant young officer into the national spotlight in the midst of the country's darkest hours." Even allowing for some marketing exuberance, it sets the bar high for Custer. Hatch makes an energetic case that Custer deserves the hype. Glorious War is his fourth book with Custer as the main actor. Hatch argues that the young officer's Civil War exploits have been undervalued because of his defeat at the Little Bighorn. He contends that Custer should be seen as "a national hero on a grand scale due to his amazing achievements in the Civil War." Hatch's unstinting effort to correct the record and his unreserved praise and admiration for his subject may cause more objective readers to question his conclusions. To his credit, Hatch admits that his book is "a testament," and maintains that "Custer's entire military career should be reassessed by fair-minded historians under a more favorable light and found to have been commendable." Custer's war record, however, capably speaks for itself. The spirited son of a staunchly Democratic Ohio family, Custer was a long shot to be accepted for West Point. Given his propensity for hijinks and accruing demerits, it was an even longer shot that he would graduate. Custer succeeded in doing both. It was probably poetic justice that he was the last of his class to leave West Point in 1861. Custer joined his unit, the 2nd United States Cavalry, in time to play a minimal role at First Bull Run. His company did, however, form the rear guard as the disorganized Union Army retreated to the defenses of Washington. Custer saw his first real action on March 9, 1862, leading his company on a saber charge against Confederate pickets near Centerville, VA. It would be the first of many. The regiment soon joined the Army of the Potomac on The Peninsula. There, the young horse soldier came to the attention of Major General George B. McClellan, a fellow Democrat but polar opposite in temperament. Asked to serve on the commanding general's staff, Hatch assumes "Custer must have been bursting with pride as he reported to the commanding general ready to prove once again that he could assume any role thrust upon him and excel." At Antietam, Custer served mainly in a staff role but, while detailed to General Alfred Pleasonton, his detachment managed to capture several hundred Confederate stragglers near Boonsboro. Custer's initiative caught Pleasonton's eye and McClellan reported the incident to President Lincoln. Between assignments after McClellan was relieved of command, Custer used the time to vigorously pursue the hand of a reluctant Libbie Bacon. It was probably only orders to return to duty in April 1863 that delayed his winning that battle, too. His new assignment again found him with General Pleasonton, now in charge of Union cavalry after the disaster at Chancellorsville. Accompanying hard-fighting Colonel Benjamin F. Davis's 8th New York Cavalry, Custer found himself at Beverly Ford at dawn on June 9, 1863. When halted by Confederate pickets, Davis and Custer opened fire and launched the Battle of Brandy Station, the largest all-cavalry engagement ever fought in North America. After Davis was killed, Hatch admits that Custer's actions "could be called a matter of interpretation." Hatch favors the version whereby Custer, "by virtue of his actions became de facto leader of an entire brigade or at least an individual detachment." Whatever the reality, Custer's aggressiveness put him in Pleasonton's good graces; fellow officers would soon be calling him "Pleasonton's Pet." Pleasonton's patronage quickly paid big dividends. While Lee moved his army into Pennsylvania in June 1863, Pleasonton recommended that new Union commander, Major General George G. Meade, promote three young cavalry officers to the rank of brigadier general. Twenty-three year old George Armstrong Custer found himself the youngest general in the Union Army. He commanded a brigade of four Michigan regiments known as "the Wolverines." Four days after his promotion, in a farm field east of Gettysburg, a cavalry fight would solidify his career and launch his reputation. Hatch belongs to the school that believes the engagement in East Cavalry Field on July 3 was an integral part Lee's ingenious attack plan to break the Union center by coordinated attack by George Pickett's infantry and Jeb Stuart's cavalry. This belief may be behind Hatch contention that this encounter and Custer's role in it probably saved the Union army but it "has all but been ignored by modern-day historians, likely due to prejudices and controversies from the Boy General's later career." Unfortunately, Hatch's bibliography omits recent studies of Union cavalry operations at Gettysburg that differ from his point-of-view. Custer's star continued to rise. His flamboyant battlefield presence caught the imagination of the Northern press. Serving with distinction at Culpepper, the Bristoe Campaign, and as a decoy during the Kilpatrick-Dahlgren Raid, Custer even found time to avenge an earlier defeat, finally winning the hand of Libbie Bacon. When Ulysses S. Grant became commander of all the Union armies and came east to join the Army of the Potomac, he brought Major General Philip Sheridan with him. Grant made "Little Phil" commander of the Union cavalry. Sheridan gave Grant's pet, Brigadier General James H. Wilson, command of the Third Division, passing over a more qualified George Custer. To his credit, Custer masked his disappointment and continued to serve with distinction. His brigade was in the thick of the fight at Yellow Tavern where a trooper from the Fifth Michigan is credited with mortally wounding Jeb Stuart. The brigade took a beating at Trevilian Station and fought with determination in the 1864 Valley Campaign where Custer finally earned command of the Third Division. Custer distinguished himself at Five Forks and the first white flag at Appomattox appeared in front his troops. After his death in Montana in 1876, Libbie Custer "worked tirelessly to protect the image of her later husband and vigorously defended him against those who brought criticism." Libbie Custer would have loved Glorious War.